✔ What is current market status according to all the news, uncertainty and fundamental analysis? ✔ What is current market status according to technical analysis? ✔ What is current market status according to Game Theory analysis? ✔ What is the conclusion after combine all the analysis above? ✔ Why most of traders and investors are making loss although they learnt a lot of fundamental and technical knowledge, skills, or get tons of news from whatever sources? ✔ How to design your strategy to fit into current market situation, helping you to prepare a trading plan with good risk reward ratio? ✔ How not to worrying about all the uncertainties all over the world but still perform well? ✔ What are stocks that have great potential for the later part of 2018? ✔ How to use CFD to take full advantage if bear market really comes? 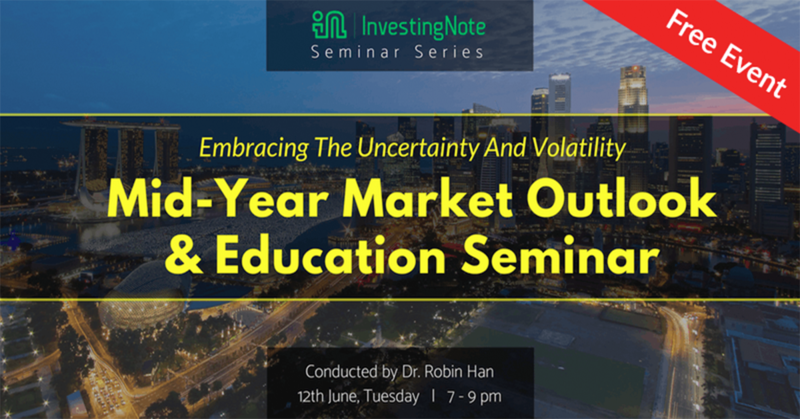 This seminar is FREE and held at SGX Auditorium on 12th June. The event will be present in English. Dr. Robin Han is a trader, trainer and top tier remisier of Phillip Securities. He is Interviewed every week on Capital 95.8 FM, regularly interviewed on TV financial programme in “Hello Singapore”(狮城有约-十分访谈) and by Lianhe Zaobao. After graduation from NUS, he started stock investment and trading, applying psychology, game theory, market trap into practice. He developed his own trading theory and system through out years of research and well proofed by the market. Dr. Han is also a veteran speaker at various public investment fairs and seminars. He is also a veteran community member @robinhan.